At this time of the year, the Martial Arts History Museum sends out letters, emails, texts, etc. to all those who love the martial arts to ask for your support for the Museum. The Martial Arts History Museum, the only museum of its kind in America, was literally built by you, the community. It was our visitors and supporters that donated and kindly gave of their time and effort to make the Museum a reality. Through the past 15 years, the Museum has brought you seminars, workshops, dinner events, brought back the Dragonfest Convention, hosted special exhibits, performed “honor days” for its pioneers, hosted movie premieres, junkets, cultural events, demonstrations and much, much more. 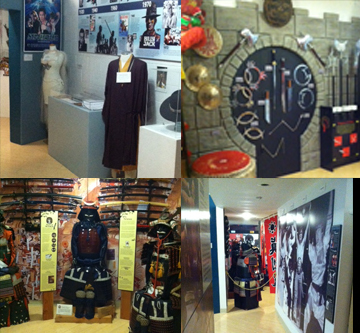 It took over 150 years of martial arts on American soil to finally have a Museum. Let's ensure this Museum will remain for many generations. Consider how sad it would be if all those pioneers are forgotten, how much of our history will be lost, how many of our uniforms and weapons we held so dear be thrown in the trash or sold at a garage sale because our grandkids didn't know what they were. It happens a lot. When people ask, can a Museum make a difference? Yes, it can. It brings validity to the arts and it shows the world we are important enough to have a Museum. It also reveals to sponsors that we have a large community which they can get behind. Imagine Gatorade sponsoring your tournament. Lastly, the Museum is a fully registered NON-PROFIT 501(c)(3) ORGANIZATION. This means your donations are tax-deductible, plus, as a member, you get a bunch of benefits including discounts to Valley Martial Arts Supply, free entrance into the Museum all year, etc.